Your Canon EOS 80D gives you a couple of options for dealing with noise. Noise, the defect that gives your pictures a speckled look, can occur for two reasons: a long exposure time and a high ISO setting. Your camera offers two noise-removal filters, one to address each cause of noise. However, you can control whether and how they’re applied only in the advanced exposure modes; in other modes, the camera makes the call for you. This filter attacks noise that can occur when you use a very slow shutter speed. Off: No noise reduction is applied. This setting is the default. 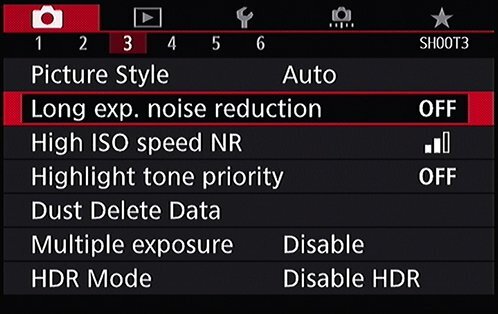 Auto: Noise reduction is applied when you use a shutter speed of 1 second or longer, but only if the camera detects the type of noise that’s caused by long exposures. Long Exposure Noise Reduction can be fairly effective, but it has a significant downside because of the way it works. Say that you make a 30-second exposure. After the shutter closes at the end of the exposure, the camera takes a second 30-second exposure to measure the noise by itself, and then subtracts that noise from your real exposure. So your shot-to-shot wait time is twice what it would normally be. For some scenes, that may not be a problem, but for shots that feature action, such as fireworks, you definitely don’t want that long wait time between shutter clicks. The MultiShot setting captures four images and merges them into a single JPEG file. Low: Applies a little noise removal. Standard: Applies a more pronounced amount of noise removal; this setting is the default. High: Goes after noise in a more dramatic way. MultiShot: Tries to achieve a better result than High by capturing four frames in a quick burst and then merging them together into a single JPEG shot. Although this mode can be effective, it comes with several caveats: flash isn’t possible, you risk having image alignment issues between the exposures, and you don’t get a Raw image. When enabled, the same symbol appears on the Shooting Setting screen and in the LCD panel. For more fine print, look up this feature in the camera manual. Off: Turns off the filter. As with the Long Exposure Noise Reduction filter, this one is applied after you take the shot, slowing your capture rate. In fact, using the High or MultiShot setting reduces the maximum frame rate (shots per second). It’s also important to know that High ISO noise-reduction filters work primarily by applying a slight blur to the image. Don’t expect this process to eliminate noise entirely, and expect some resulting image softness. You may be able to get better results by using the blur tools or noise-removal filters found in many photo editors because then you can blur just the parts of the image where noise is most noticeable — usually in areas of flat color or little detail, such as skies.